Do you ever watch a video and wish you could save it to your local drive instead of online? Sitting in numerous hotels with very slow download speeds, waiting 20 minutes to view a 2 minute clip on YouTube, can be beyond frustrating. Life is too short for that, especially if it is the type of video you would want to watch more than once. Well, here is a possible solution. 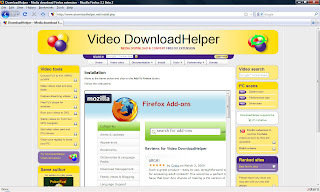 This Firefox Add-On should help you download from many site, though to be a little cautious, it seems a recent version still has a few bugs. (With new software it is always worth reading the users feedback comments.) Yes there is a logo which you have to pay to remove, but that seems reasonable in a commercial world.